I set out proudly on my S7D having a great deal of confidence that my noble steed would deliver me safely to Jefferson, PA and back. I was not disappointed. 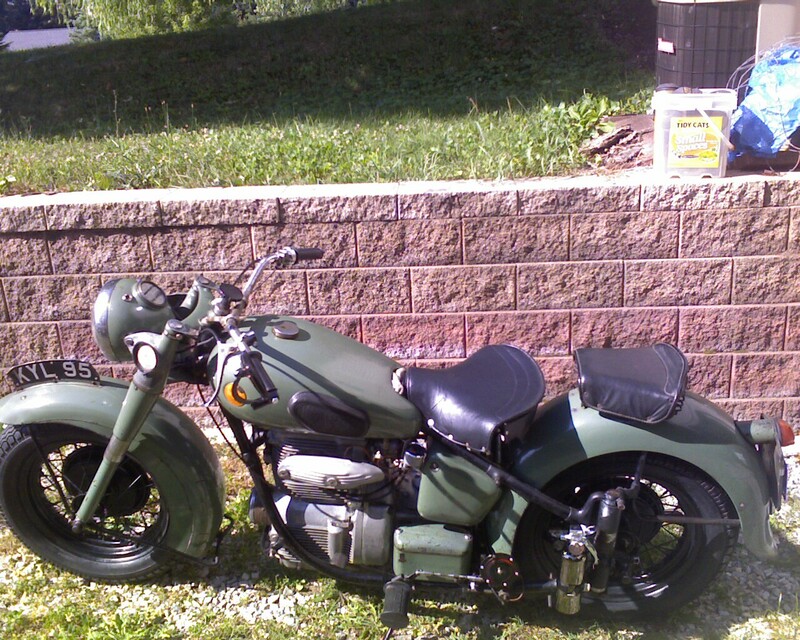 I met up with a friend who has a meticulously restored '48 Harley-Davidson. Our bikes were a great match for riding together. The Sunbeam accelerates slightly faster, probably because it weighs less... or it could be that the hand shift on the Harley makes it a little more cumbersome. We took a leisurely 40 to 50mph pace. There are a few clatterings from the valve rockers, but nothing to really be concerned about. Oil flows freely and with enough pressure at speed to keep my mind at ease. Even at +90'F temperatures on the return trip, the oil light only flickered when idling in traffic. We met with some interesting characters at the White Rose MC Club facility. I finally met Bob and Mrs. Bob from Bob's Indian, just a few miles from my home. They've been running the rally for years. There was a fellow from Virginia who had been coming for 40 years. He recently had a barn fire which destroyed his collection. He managed to find a beautiful Roadmaster to bring to the show. His grandson was with him carrying on the legacy. That's great to see. We were lucky to see some non Indian classics as well. There was a Matchless that drove in, along with a very original Henderson 4. Attention soon turned to the Sunbeam. I met a SOF member Bob from Maryland. I gave him this website and I hope he'll write in. He's got a Polychromatic Grey S8 that he's got roadworthy and I'm interested to see photos. I'll surely see him again in October for the Antique swap meet since he's apparently quite the eclectic collector. All in all it was a great morning. I covered over 70 incident-free miles on KYL95 and I'm proud that its able to go out under its own power for exhibition.